Dr. Boardman graduated with a Bachelor of Dental Science from the University of Melbourne in 1998. He was awarded the William Leslie Elvins Prize in Oral Surgery and the Des Crack Memorial Prize in Paediatric Dentistry. After graduation, Nick worked in general dental practice and taught undergraduate dental students for 12 years, before undertaking postgraduate specialist training which he completed at the University of Melbourne in 2012. 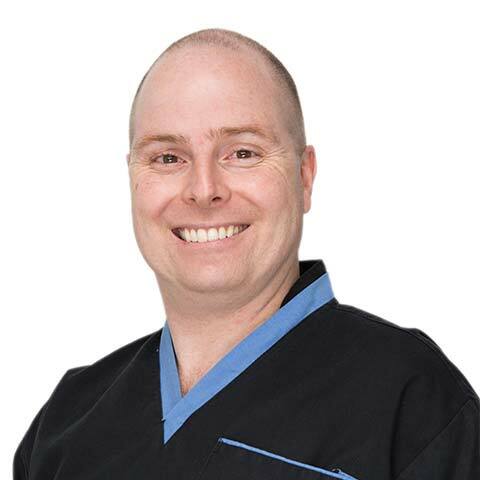 He practices all aspects of periodontal therapy and dental implant surgery at our Melbourne CBD practice and has a keen interest in mucogingival problems. Nick is a member of the Australian Dental Association (ADA), the Australian and New Zealand Academy of Periodontists (ANZAP), the Australian Society of Periodontology (ASP), the Australian Osseointegration Society (AOSVB) and the International Team for Implantology (ITI). He has served on the AOSVB Executive Committee since 2009, presently as the Treasurer, and is the current Chair of the ADA Melbourne City Group. He regularly attends continuing professional development courses both nationally and internationally. Nick is dedicated to patient care and has a compassionate nature. He enjoys running, recreational cycling and fishing and along with his partner Kate, takes great pleasure in spending time with his dogs.